Sig Sauer’s answer to concealed carry is their P320 Nitron Carry. This pistol provides reliability in a variety of calibers with modularity that provides customization for every shooter. If we were to put this pistol in a class, it’d go right beside the Glock 19. 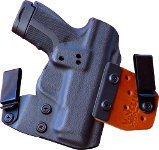 Read our review below, then browse our Sig P320 concealed carry holsters above. When it comes to safety the P320 Carry does not require pulling the trigger for take-down; with a smooth, consistent, 5.5-7.5 lbs trigger pull. It also comes with a 4-slot rail that all duty pistols (like the G19) needs to mount lights, lasers, &etc. To start with the P320’s modulation, SIG has three different grips: small, medium, and large to fit any and every shooter, with a second frame. The medium, full-length grip is SIG’s standard for the P320, however. For further modularity, SIG has the option to order all the different conversion parts for the fire control unit. The modularity of this pistol makes cleaning a breeze and take-down a snap (with some practice getting the take down level back into place). The magazine release can be moved for left-handed shooters and has a tactile texture for easy, controlled depression with easy thumb-reach. The slide release is already ambidextrous and rests at the rear of the slide for quick access. For the sights, the P320 Carry has the SIGLIGHT sights, which are fully metal. The fully stainless steel P320 Carry is coated in SIG’s Nitron polymer finish, for rust resistance and durability. As far as concealed carry is concerned, concealing the P320 Carry in a Sig Sauer P320 IWB holster is almost the same as carrying the Glock 19. The P320 has the same length as the G19, so comparatively speaking, printing for both pistols would be about the same. See for yourself in our Sig P320 Kydex holsters.